Even setting all the safety systems aside, the SawStop JSS-MCA is one of the best table saws we've ever tested. It was during a time when I was in-between table saws that I first read about SawStop technology. Its safety features quickly impressed me as did the build quality of the tool. While I liked the design, I didn’t exactly have the room for a full-size cabinet saw in my little shop. When the SawStop jobsite table saw came out I didn’t have any more excuses. The SawStop jobsite table saw isn’t inexpensive. The saw runs $1,299 plus shipping. Still, almost losing a digit some years ago drove me to pull the trigger and place an order. In the end, buying a SawStop JSS-MCA just made sense. I ordered my SawStop Jobsite table saw from a small dealer. The saw shipped directly from the manufacturer to my home. When I returned from work a week later, a box the size of a chest freezer sat in my backyard. The saw comes safely nestled in styrofoam, and I found a clear set of instructions on how to get the wheels on and the saw out of the box. In under 5 minutes, the saw was prepped for making its first cut. I plugged it in, let it run its diagnostics, and fired it up. It sounded good, so I rolled it down to my workshop. The saw navigates easily and rolls much like a wheelbarrow. The SawStop JSS-MCA has excellent aboard storage—something you almost never see with a jobsite table saw (or any other saw for that matter). Simply slide open the table, slide out the plastic storage compartment, and flip it open. It reveals storage for your saw guard, 3-5mm wrenches, and miter block. You can also fit a spare brake in there. The fence on the SawStop jobsite table saw is nice and smooth. It doesn’t have a complicated rear connection point. Instead, the back of the fence rides on a wheel, so that the top-mounted lock can secure the front of the fence. This front anchor is similar to how a Biesemeyer fence works. All of the movement and locking is up front on the business end. Grab it in the middle, and it actually won’t slide smoothly for you. The fence slides (glides, really) left or right easily when you move the front edge along the track. To lock it down you just push down on the centrally-mounted red lever. If you push on the back of the fence, you’ll feel a bit of give. However, that’s the case with even the best fences. If everything’s aligned correctly, it shouldn’t take much pressure to slide your material evenly along the fence. One improvement would be to make the front cross bar of the fence a bit wider to offer even more stability. To open up the table you swing open the tab located under the 6-inch left-of-blade mark and slide the table to the right until it stops. Once opened, the red measurements on the front of the table now correspond to the correct right-of-blade distances. Built into the fence is a material support that’s deployed via a top-mounted dial. This will help support your work when the table is extended wide, and the fence is over the newly-created open space. This is with the table opened up wide and the fence positioned over the opening. Without the integrated material support, you couldn’t easily make a clean cross cut or rip on certain sheet goods and materials. For blade and tool storage, the rear of the SawStop JSS table saw has you covered. A nifty spring-loaded pin system pulls and turns to let you slide on and store an additional 10-inch blade and the two blade tools. I’d like to see more capacity here for adding at least a second blade. The push stick, fence, and cord wrap are located on the right side of the table saw, and everything locks into place nicely for travel. The plastic push stick has a rather shallow lip, but it will do in a pinch. Accessing the SawStop blade is easy. Removing the blade guard and swapping it out for the riving knife is easier still. The non-conductive throat plate lifts off easily, and there’s a ton of room for your hand to flip the release lever. 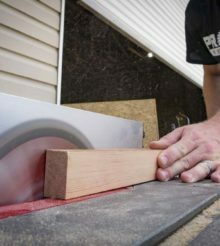 Adjusting the depth of cut on the SawStop Jobsite table saw is almost ridiculously easy. Unlike most saws, the depth adjustment wheel is geared so that one complete revolution raises the blade fully up or down. It’s equally simple to adjust bevel. You just grab the back of the wheel and pull as you slide the blade left or right. Adjacent to the large wheel is a fine adjustment knob to dial in the bevel to the exact degree you need. This caused some concern from at least one of our Pros since there’s not hard stop on the fine adjustment knob. That means that while you can calibrate the bevel stop to a perfect 90—you can throw that off the tiniest bit with the fine adjust at any time. The controls for the saw are fairly intuitive, and I really like the big paddle Off switch that can be easily hit with a knee. A dual LED indicator which shows the status of the system using a lot of different combinations. These two lights have a combined total of 12 different indications for telling you what the saw is doing or what mode it’s in. Fortunately, SawStop provides a guide on the saw itself or we’d be lost. One of those statuses is particular handy. If you put the saw into bypass mode you can run a piece of wood or material through it and then check the lights to see if it would have triggered. That lets you know whether you can run the rest of the cuts in normal mode and benefit from the protection the saw offers. SawStop actually has a patent on this. I purchased my particular saw at full retail and had some trouble with the extension table. I believe it may have gotten bent or otherwise warped during shipping. SawStop was impressive about making it right. They had no problem swapping out the bum part, and customer service was attentive and knowledgeable. This type of attention (they didn’t know I was reviewing it, nor did I tell them) inspires confidence in their products. Max. rip right of blade (extended): 25-1/2 in. Dust collection with portable jobsite table saws always proves to be tricky. With a Bosch VAC140A dust extractor hooked up to the back of the saw, it still generated an impressive amount of fine dust. To me, it seemed to make a bigger mess than even my old DeWalt. This may be a factor of requiring that the blade be exposed underneath the saw to allow for the safety brake/cartridge to stop the blade. At the Pro Tool Reviews Shop, the guys felt the SawStop was one of the better-performing saws, with very little dust drop at the bottom and only fine particles up top. I happen to be particularly sensitive to that fine dust and do everything I can to mitigate it. Adding the optional SawStop saw dust collection blade guard JSS-DCG could significantly reduce the top dust. It requires some configuration, and would likely appear only on jobsites that required near-total dust mitigation. For anyone cutting wet wood or anything containing metal, the SawStop jobsite table saw includes an override mode. When used in this mode you are turning off a significant safety feature of the saw, but you can cut conductive materials like wet pressure-treated lumber, aluminum, foil insulation sheets, or anything else that passes electricity. My first actual cut with the SawStop jobsite table saw was in 3/4-inch plywood, and I found a clean 90 degree edge. I was, and continue to be, pleasantly surprised by the quality of the stock saw blade. In addition to plywood, I have run beech, oak, and maple through the SawStop Jobsite table saw, and it has plowed through all of the materials with ease. The saw has very little vibration, and has yet to get bogged down. Even ripping a laminated beech countertop down proved to be no problem. If you’ve used other jobsite saws, the smoothness of cut will impress you, and it makes for a confident cut. For further testing, and as part of the portable jobsite table saw shootout, the folks at Pro Tool Reviews procured a second saw and installed a 10-inch Diablo 40-tooth blade for consistency. They ran pressure-treated lumber through the saw along with 3/4-inch plywood and commercial grade pallet wood. These pallets housed air large conditioning and refrigeration units for Publix, a regional grocery store chain based in Lakeland, FL. The tough pallet wood was essentially 6×6 lumber topped and bottomed with and 2×6 boards. At the end of their testing, they agreed with me that this saw has significant power and makes nice smooth cuts. It’s a great portable table saw for the jobsite. No review of the SawStop jobsite table saw would be complete without an examination of the flesh-detection safety system. The folks at Pro Tool Reviews handled this as I didn’t have extra brakes and blades available to replace after the unit activated. They actually got the saw to trigger off of a super wet piece of pressure treated 2×10. The folks at Pro Tool Reviews (It was Clint—don’t tell anyone!) neglected to put the saw into bypass mode before making the cut and got to see exactly how quickly the mechanism triggered! You can see that this Freud Diablo 40 tooth blade is toast and needs to be replaced along with the spent SawStop brake mechanism. The serial controlled brake mechanism is completely replaceable and surprisingly self-contained. It really has to be in order to be practical. That didn’t stop us from being impressed by the way it was designed. Everything from the spring mechanism to the aluminum brake itself is involved in getting that blade to stop instantly and tucked down below the table to avoid injury. The aluminum break not only had the Diablo blade firmly embedded within it, it was slightly deformed. Like a vehicle’s “crumple zone” it took the brunt of the force of the blade and absorbed the forces while stopping it cold. We’ll be performing several additional tests in the near future. There’s no shortage of videos showing the flesh detection capability of this saw, but our comparison of the SawStop vs. Bosch ReaXX should include some surprises. Keep your eyes out for that in the next couple of weeks. A pretty handy guy who upgraded his 11 amp Milwaukee SawZall to a 15 amp model—not because the 11 amp was bad—but because there was one that went to 15. Jeff has spent time framing, plumbing, hanging cabinets, decking, installing trim, laying tile, spraying cellulose and spray foam, and building furniture....but he doesn't do heights, will not roof, and HATES painting. His worst nightmare job would be repainting steep roofs. I’ve been looking into getting a portable table saw, so I know that you can get a nice one for 400 bucks…this is over 3 times that price and yet you gave it 4.3 stars in the “value” category? !